This is perhaps one of SightLines superior services. We have had many many hundreds of pleased, satisfied and repeat customers for this service. Wrapping a vehicle is no simple feat and we pride ourselves at being the best in the region. We do not take short cuts and we ensure that the wrap has the longest life possible. We use only the top rated vinyls, top quality inks, top quality laminates (to ensure lasting color) and we are very pleased to have on board some of the top installers in the region. This is a huge cost effective advertising medium for business' and services. We ensure our product looks and holds up as good as the product and or service you are promoting. We understand that image is everything and our vehicle wraps are always on target! 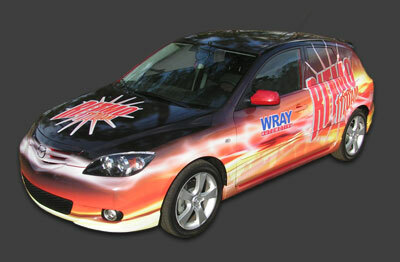 Fleet and vehicle graphics are proven for giving your business a professional appearance and is crucial for branding. While wraps is a major specialty of ours we do all sorts of vehicle graphics: full wraps, partial wraps, hybrid wraps, fleet striping and lettering and decaling. From design to installation we can handle all of your fleet and vehicle graphics needs. Cars, Trucks, Vans, Semi's, Trailers, RV's Boats, Motorcycles to Golf Carts. We will wrap you right up. Our experts can take your ideas to the next level. Just tell us what you want the look to be and we will make it happen. You can provide us with all the graphics you want used and we can provide even more if you wish. We will work with you through the design stage to arrange the elements to fit right and look visually appealing no matter what the vehicle type. This is a critical for thing for vehicle wraps as you do not want an important part of you name over certain things such as door handles and mirrors. We will arrange the elements of the advertisement to achieve the best visual appeal while increasing the visibility of your message. Give us a call today to see how we can help take your vehicle or fleet of vehicles to the next advertising level. Don't waste the space!